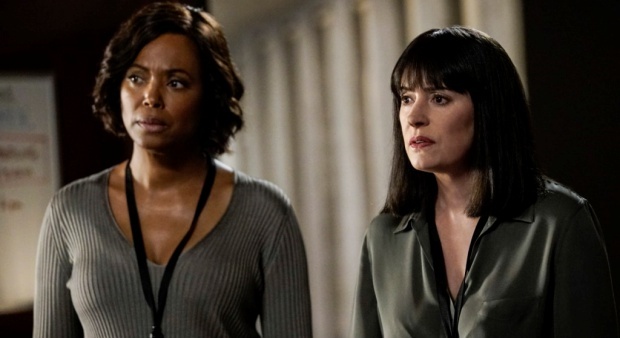 REVIEW for Criminal Minds Landmark Season 14 Premiere: "300"! Hi 300. Nice to see you. We’ve been waiting for you for a very long time, indeed. The opening bell was a shot of Hotch, Gideon, Morgan, and Reid all walking into a building with Rossi’s voiceover “I’ve seen a lot of great agents pass through those doors…”. It was a perfect way to honor those departed, with Reid providing the bridge to our current team. What a treat to see again all of our BAU babies in their infancy, their first day on the job. There’s a recap of last season’s pertinent points, then a gutshot Quinn in the parking garage (I still don’t trust him), with JJ and Luke there to help him as Merva and Meadows make their escape. We see via tablet our good Dr. Reid alive but hurt, and *swipe* there’s Garcia hollering bloody murder to get her outta there! Penelope has learned a thing or two along the way, and I like the tougher side of her. Our girl is always going to be averse to the harsh, but she also has a clever head on her shoulders, even through her tears. It seemed as though everyone on the show felt the weight of this landmark episode in the best way- a way that 200 did not. While 200 had some good callbacks, and killer practical and cgi effects, the only really human standout on the team was JJ, and no matter what you think of that episode, you must admit that AJ ROCKED it, full stop. Speaking of JJ, she tells Emily, and finally us, about what happened on her and Spence’s one and only date back in season 1. It was cute, and now it’s canon, but it also rang a little false. Shoehorning Penelope into JJ and Spencer’s dense and layered relationship to somehow dilute their intense feelings for each other seemed a lazy trick. There is a deep, friend love for Garcie, maybe even sisterly on JJ’s side, but they ain’t the Three Musketeers. Spencer and JJ go far beyond that, and I wanted to hear what happened between the two of them, however awkward, on that indelible first outing. I feel a little cheated that we didn’t get that. Still, 300 was allllll about the human, and you won’t hear one complaint about that from me. The team’s urgency, their amazing profiling, how they had to deliver the profile to each other in order to find Reid and Garcia was incredibly cool. I like how the newbies Luke and Matt contributed solid skills (Luke catching and reading Spencer’s ASL was a highlight}, Tara and Emily were practically mind-melded, and they bounced off each other to great effect. I liked how close-in this one was, how internal with our team (HI, Anderson! ), how privy we were every step of the way. It was interesting to see how Tara, Luke, and Matt had to sort things without the benefit of Garcia’s expert handiwork. Hyoid bones? A floaty bone in our throat? Gross. But they deduce it’s not a cult thing, but a Merva thing. Once they calculate the number of victims , they figure out that Reid is supposed to be the 300th. Emily finally remembers Meadows from BENJAMIN Cyrus’s polygamy-slash-goddish cult, and we’re off! 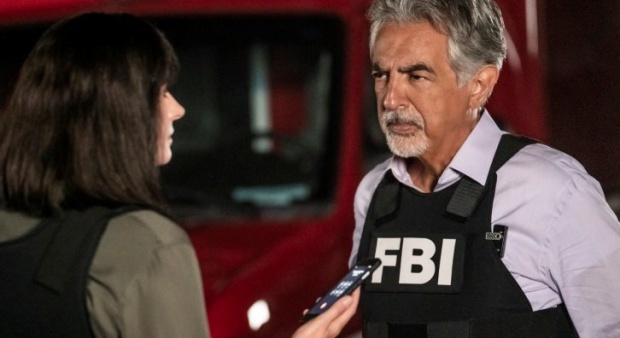 Garcia’s escape after Reid is able to quickly whisper to her about a diversion and the car is as freaking adorable as it is improbable, and she RUNS OVER MEADOWS making her getaway! So awesome. So much of what Penelope does in this episode is a favorite thing. She gets to the BAU and tells them all where he is/was, but oh no she disabled their truck detectors so the team has no idea where the cult is going. She feels guilty af, and I love her focus and urgency here. Another highlight for me was the team not sure where to land the jet, and trying to find the right biblical passage for 10:23. Not sure if the fact that it was “Matthew” was an inside joke or just a coincidence. 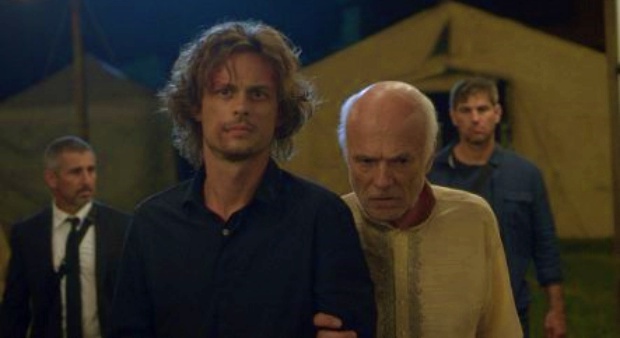 Seeing Reid use his full faculties to exploit any weakness in his captors, and watching him form and enact his own plan erases any lingering concern that his stint in prison damaged his abilities permanently. It’s welcome, indeed. The beautifully sentimental memory when Meadows mentions that he has to have something to hang onto, and he flashes on JJ asking him to be Henry’s godfather (from Memoriam, written by Dan Dworkin and Jay Beattie) is a shot through ALL the feels. When he then started reciting Turn, Turn, Turn in order to stall them, I chuckled and cheered in equal measure. On the jet home, JJ sits with him, then reaches out a hand for him to grasp, which he does, rubbing the back of her hand with his thumb. They look into each other’s eyes and she stands, leaning over to briefly touch his knee, which he immediately grazes as if to feel her warmth, sad to have missed her hand. No words are necessary (unless there ARE words that were cut for time and oh they had better be on the DVD). She goes and sits next to Rossi as Emily takes the seat across from Spencer. In a setting nicely reminiscent of the end of Minimal Loss, she teases that he looks ‘tough’ with those bruises and he shoots back that that’s what he was going for. Reid then, in a confession unusual for him, brings up how he loves them all. Emily says they know. It’s gorgeous, this important episode was just gorgeous. I’ve been everywhere from reddit to ITV and PTV, to twitter, to facebook, insta and tumblr, medium and more and I’ve seen universal love for this one. Thank you all for all your hard work, CM peeps. Thank you for honoring the history of this show that’s so dear to our hearts. We love you. And we hope you know. 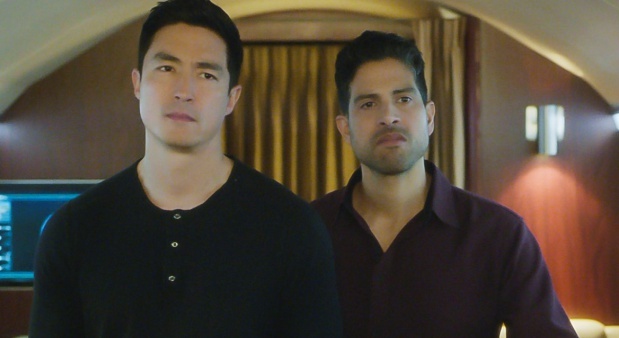 ← Criminal Minds Showrunner Sheds Light on Season 14 Premiere, “300”! I don’t think it tries to. But this was emotional, clever, and paid such homage to the entire body of the show, harkening back to the very beginning. Well done, show! Thought this was a great episode! No milestone episode will ever live up to 100 but I don’t expect it to at this point. I liked that the episode was very “human” as you described. That was the main problem I had with 200, while that is still one of my favorite episodes and AJ KILLED it!! I felt like they were trying so hard to rush a huge story into 45 minutes that the writing made it seem like the team didn’t even care that JJ was missing! 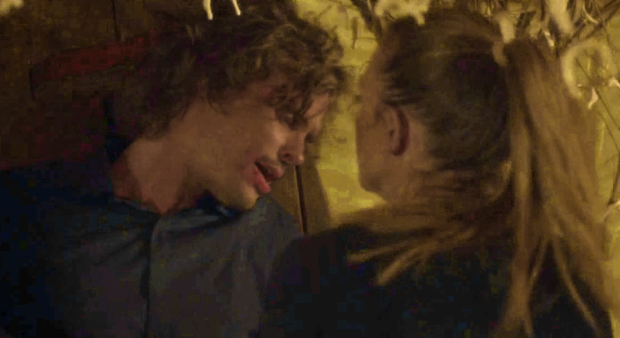 The whole thing was weird (and don’t even get me started about how they had JJ at a bar after being tortured for 24 hours instead of being in a hospital or at home with her family…..) Anyway, I love all the little team moments in this episode and was freaking out when they mentioned JJ and Reid’s date from back in season 1. But like you, I was a little disappointed in the explanation. Although JJ and Garcia are incredibly close, I remember all those scenes in Garcia’s office and JJ’s office back in the early seasons but it doesn’t come close to JJ and Reid’s relationship and I felt like we were cheated. It’s pretty obvious Reid is in love with JJ and I feel like it’s a huge elephant in the room most of the time. The Unsub story was okay, they are never that good in my opinion. They used to be but around season 6 they started being boring, not sure what happened. But tbh that’s not the reason I watch anymore, I watch for this team and all of their interactions with each other and that is exactly what we got in this episode. I loved Reid and Garcia’s moments together. I loved the episode. Well done everyone. Of his nerdy outfits. Garcia was great. I wouldn’t want to kidnap her. Great show. I didn’t like what they did with 300th episode. To me the whole point of this episode was Garcia’s abduction, and they made her escape like in 10 minutes. The car she escaped on magically had keys in the ignition and Medows didn’t even shot at the car. The team had no action at all, they were basically just sitting and thinking what to do. After Garcia escaped, it did become a bit more interesting, she brought some action to it, but it wasn’t what I expected at all.